Clients are SHOCKED HOW HELPFUL I AM! The same consideration should be given to hiring a REALTOR & Mortgage Broker as hiring any other professional. When I look for a doctor, accountant or attorney, I want someone that is well educated, has experience, ethics and a track record of satisfied clients. What is most important is I want direct answers to direct questions!!! 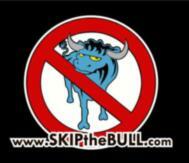 That's why I picked www.SKIPtheBULL.com I don't play games with my clients! If you want someone to sugar coat bad news, tell you your home is worth more than it is, tell you can get a great rate on a loan with bad credit, then hire someone else! If you want a relatively STRESS FREE transaction, Call, email, Txt or visit my website 7 days a week!